I must start this review by giving a vote of thanks to Pastor Dr Sola Fola-Alade and Trinity Chapel for hosting this event. In the past top US gospel artists would look to churches to bring them over to their UK fans, but the trend over recent years has been for Churches to shy away from this, leaving it to (often secular) promoters. This trend has brought rise to the fleecing of gospel music fans by money motivated promoters putting on half-baked events and taking the money out of our industry. This one, however, was back to the good ol’ days when you could get real close to gospel music royalty in an intimate concert where it still felt like we were havin’ church. I arrived a little late and expected to walk into the venue while the support acts were in full swing, but, ‘due to technical difficulties’ I simply joined the others who were patiently waiting for too long already. By the time our hosts Tola Onigbanjo and Eddie Kadi finally came on it was obvious that it would take more than a couple of one-liners from them to warm up the crowd. Bring on the acts already! Up steps Rachel Kerr. Armed with her breathtaking vocal ability, she started with an accapella song and by the time she finished off with ‘Kingdom Solider’ the audience had started defrosting. Next ting: Guvna B. One of the UK gospel’s finest recording artistes proved that he is becoming one of the best live MCs with a well polished set. No more thawing needed, everyone’s on their feet now! The party is heating up. Time for a set from up and coming RnB/worship artiste Matthew Allan, some hilarious Eddie Kadi stand-up and an intermission before the main event. Finally the moment we’ve all be waiting for. On come the backing singers and band, then on comes Kirk Franklin, understated in a black t-shirt and jeans, looking relaxed, as ever. He goes straight into the music, leading the songs, but hardly singing a word. He doesn’t need to sing much, most of his songs use female choir lead vocals plus the audience are singling along to every word anyways. Leaving Kirk with plenty of time to dance, crack jokes, pose for camera phone pictures and show love to the fans. Kirk’s dance moves are something else! Sliding across the stage effortlessly, he’s like the James Brown of Gospel. 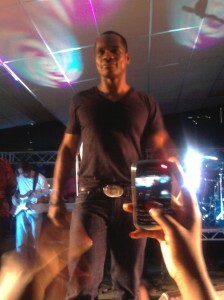 So natural on the stage, he has got to be one of the all time great gospel performers. Him and his band had a relaxed air about them like they had done this show a million times before, yet they were enjoying themselves just as much as the audience. One of the best bits was when Kirk sat down to play lead piano and let the backing singers and band take turns to freestyle solos. Real intimate. The time flew by. Kirk sprinkled just the right amount of well known classic worship choruses in between his huge catalogue of contemporary hits. How many artistes do you know that can do a 90min set where the crowd sing (and rap) along to every song? Some people would have baulked at the ticket price, but those who did come along would testify that it was worth every penny considering we got a rare chance to see a full concert from one of Gospels all time greats, who is still at the top of his game after 15 years. For real! Funky Fresh 2 will be huge!